During the Good Friday Triduum yesterday, the painting of Leonardo Da Vinci came into mind. I had the chance to take a look at his masterpiece "Il Cenacolo" in the refectory of the Dominican convent adjoining the church of Santa Maria delle Grazie*, Milan, Italy in 2006. We took the train from Venice to Milan just to see this. With the growing popularity of the painting after the release of Da Vinci Code** (the movie), it requires several weeks of advance booking. So I booked a city tour of Milan including a visit of Cenacolo for $54 (now the tour is selling at $74 in viator.com!) to get a guaranteed entry to the refectory. Ticket price is only 6.5Euros, so much for the service fee! But it was worth it, this was my fave stop (and we found several tourists begging to enter that day). We've always had a jigsaw of it framed and hanged by the staircase but little do I know about the painting's history. All along I thought it was a framed painting like what I see everyday with the carpet and vase in front (notice it?). 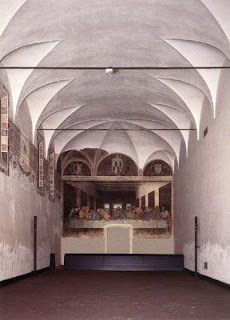 Leonardo abandoning the traditional method of fresco painting, depicted the scene on the wall of the refectory. 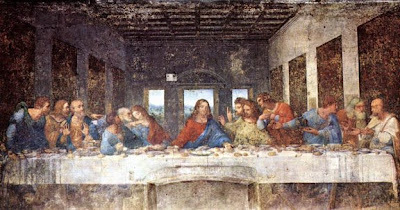 It was designed such that when they ate at the refectory, it was as if Jesus was having his meal in front of them. In awe, I can say it looked so real! Extensive measures have been implemented to protect the fresco from further deterioration. Visitor intake has been restricted to a group of 25 every 15 minutes passing through several security clear glass doors to maintain a certain room temperature and limit exposure to light. **If you've seen Da Vinci Code they argued that John isn't John but was a girl in the person of Mary Magdalene. Our guide (who is a historical art major) during our visit at the Vatican Museum explained that young men were often depicted with long hair. *Il Cenacolo Vinciano of Santa Maria delle Grazie is located in Piazza Santa Maria delle Grazie nr. 2, in Corso Magenta. Opens from Tuesdays to Sundays. For more info, visit cenacolovinciano.org. hahaha Don't complain na lng coz you got your share of perks, you get to travel for free!